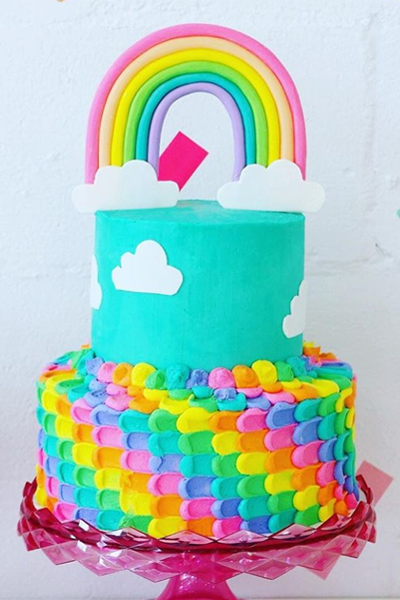 It’s simple to create a rainbow cake that will thrill the kids and WOW the adults – especially when you use boxed cake mix and our easy-breezy frosting mix! 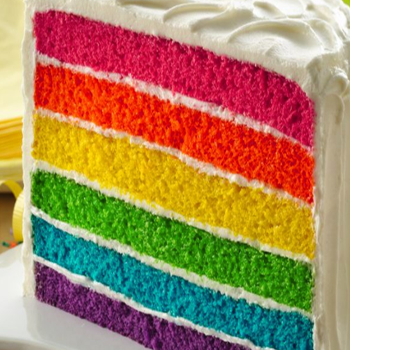 Follow these simple steps to create an Instagram worthy rainbow cake. Pre-heat oven to 350°F. Spray 3 (8-inch) round cake pans with cooking spray. In large mixing bowl, beat cake mix, water, oil and eggs with electric mixer: low speed 30 seconds; then medium speed 2 minutes. Scraping bowl occasionally. Divide the cake batter evenly among 6 small bowls (approximately 1 1/3 cups each). Use the food colors to tint batter in each bowl: 1 blue or turquoise, 1 red or hot pink, 1 green or lime-green, 1 yellow, 1 orange (using red and yellow) and 1 purple (using blue and red). Refrigerate 3 colors of the batter until ready to bake them. Pour remaining 3 colors of batter into individual cake pans. Bake 18 to 20 minutes or until cake springs back when touched lightly in center and begins to pull away from side of pan. Cool for 10 minutes, then remove from pans to cooling racks to cool completely before frosting. Wash cake pans and dry thoroughly. Bake and cool remaining 3 cake layers as directed. In a large mixing bowl, beat shortening and butter with electric mixer on medium speed until light yellow. On low speed, gradually beat in powdered sugar. Beat in vanilla. Add milk, 1 tablespoon at a time, beating until frosting is smooth. Beat on high speed until light and fluffy. Trim rounded tops off cakes with long serrated knife to level, if necessary. On a large flat serving plate or cake stand, place purple cake layer. Spread with frosting to within 1/4 inch of edge. Spread light coat of frosting on top and side of cake to seal in crumbs, then frost with remaining frosting. Decorate!